The razor-thin and lightweight EZBook 3S ultrabook comes with Intel's Celeron N3450 ULV quad-core CPU, coupled with 6 GB DDR3 RAM, and offers an unexpected 256 GB SSD solution. The HD Graphics 500 iGPU powers the 14-inch 1080p IPS display and the 10,000 mAh battery should last for 3-5 hours. 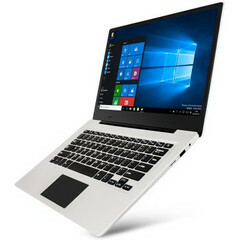 The Jumper EZBook 3S is one of the slimmest ultrabooks on the market, and you can snag it for only US$278. It is only 0.31-inch thick and weighs as little as 2.7 lbs. So what could the Chinese specialists from Jumper fit into such a slim casing? Powering the EZbook 3S is a ULV Celeron N3450 quad-core CPU with default clock running at 1.1 GHz and boost clocks going up to 2.2 GHz. This is coupled with 6 GB of DDR3 RAM, and the included M.2 256 GB SSD should provide blazing fast load times in applications. There is no dedicated GPU but the integrated HD Graphics 500 chip clocked at 700 MHz should be enough for games like League of Legends. This deal will be available for 9 days on Lightinabox.com, and the Chinese site offers free 4-7 day express delivery.